The Santiago Bernabeu Stadium (Spanish: Estadio Santiago Bernabéu [esˈtaðjo sanˈtjaɣo βernaˈβeu̯]), is the current home stadium of Real Madrid. 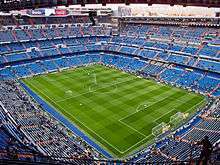 Santiago Bernabeu is one of the world's most famous and prestigious football venues. It has hosted the European Cup final on four occasions: in 1957, 1969, 1980, the UEFA Champions League Final in 2010. The final matches for the 1964 European Nations' Cup and the 1982 FIFA World Cup were also held at the Bernabéu. The improvements included a number of points. First, FIFA forced two-thirds of the seating area to be covered. For this reason, Real Madrid installed a roof covering the perimeter of the first and second tiers of seating, except the east side. The stadium's capacity was reduced from 120,000 to 90,800 spectators, 24,550 of which were covered by the new roof. The project also involved remodeling the façade, the installation of new electronic signs in the north and south ends, as well as the renovation of the press areas, lockers rooms, access, and ancillary areas. The stadium hosted four matches in the World Cup: three second-round Group Two matches (West Germany vs. England, West Germany vs. Spain, and Spain vs. England) and the prestigious final match between Italy and West Germany. Following a series of spectator fatalities in the 1980s (most notably the Heysel Stadium in Belgium and the Hillsborough Stadium in England), English authorities released the Taylor Report on how to improve football spectator safety in English venues. UEFA followed suit across Europe. The stadium was forced to create separate shortcuts to different stadium sections and seats for all spectators. In the 1990s, the Santiago Bernabéu went through a large expansion and remodeling. The board of Ramón Mendoza awarded the project to Gines Navarro Construcciones, S.A. The work started on 7 February 1992 and concluded on 7 May 1994 with a final cost of more than five billion pesetas, substantially raising the debt of the club, having no institutional support. As a club representing the rich and the powerful of Spain, Real Madrid has a very demanding clientele. When Florentino Pérez became the president of the club, he launched a "master plan" with one goal: to improve the comfort of the Santiago Bernabéu and the quality of its facilities, and maximise revenue for the stadium. Following the enlargement of the lateral east side and the creation of new galleries, the capacity of the Santiago Bernabéu was 80,354, all seated. In 2007, the 1,000th game was played at the Santiago Bernabéu. 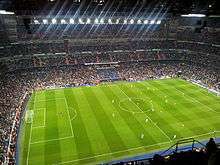 In addition, the latest revision of UEFA on 27, on the occasion of Champions League match against Olympiacos, served as a final step to give the Santiago Bernabéu elite stadium status on 14 November 2007, a month before the celebration of the 60th anniversary of the inauguration of the stadium. UEFA announced that the club will officially rename the elite stadium. The last change was a small increase to a capacity of 85,454, effected in 2011. Santiago Bernabéu hosted three matches of the 1964 European Nations' Cup, a tournament which Spain hosted, the matches included one Qualifying match and two in the main tournament including the final. All of the matches involved Spain. The stadium hosted one qualifying round match against Romania, which resulted in a 6-0 win. 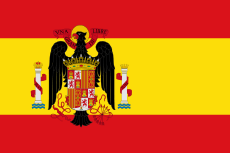 In the 1982 World Cup held in Spain, the Santiago Bernabéu Stadium hosted four matches: three in the second round (West Germany - England, West Germany - Spain and Spain - England) as well as the final between West Germany and Italy. The stadium is served by its own metro station along the Line 10 called Santiago Bernabéu. It is also served by bus routes 14, 27, 40, 43, 120, 147 and 150. The stadium is 8.2 miles (13.2 km) away from the Barajas International Airport. ↑ "Madrid and Hamburg awarded 2010 finals". UEFA. 28 March 2008. Archived from the original on 31 March 2008. Retrieved 28 March 2008. ↑ (in Spanish) Un nuevo Bernabeú galáctico. Yahoo! EuroSport, 11 September 2009. 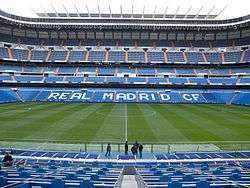 ↑ "Real Madrid "working on" Bernabeu naming rights partner – Perez". goal.com. 16 October 2013. Retrieved 24 October 2013. ↑ "Real Madrid reveal £330m design for new Bernabeu stadium". BBC Sport. Retrieved 1 February 2014. ↑ Edwards, Piers (28 October 2014). "Estadio Santiago Bernabeu: The $500m stadium wrapped in a glowing 'skin'". CNN. Retrieved 6 March 2015. 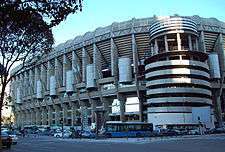 ↑ "Real Madrid and IPIC sign agreement to renovate Bernabeu stadium". La Prensa. 28 October 2014. Retrieved 6 March 2015. ↑ Duff, Alex (28 October 2014). "Real Madrid Gets Stadium Financing From Abu Dhabi's IPIC". Bloomberg. Retrieved 7 March 2015. ↑ Díaz, José Félix (25 October 2014). "Bernabéu sheikh-up: Abu Dhabi coming on board". Marca. Retrieved 7 March 2015. ↑ Martin, Sean (19 November 2014). "Real Madrid's Stadium to be Renamed 'IPIC Bernabeu or CEPSA Bernabeu'". International Business Times (UK). Retrieved 7 March 2015. ↑ Hall, Joe (28 January 2015). "Real Madrid stadium could be renamed "Abu Dhabi Bernabeu" due to UAE investment". CITY A.M. Retrieved 7 March 2015. ↑ "Real Madrid president caught revealing IPIC stadium name". Zee News. 19 November 2014. Retrieved 7 March 2015. ↑ Brewin, John (1 May 2008). "European Nations Cup 1964". ESPNSoccernet.com. ESPN. Retrieved 28 January 2013. ↑ "Sparkling Italy spring ultimate upset". Glasgow Herald. 12 July 1982. Retrieved 30 April 2014.